There's nothing like a sticky sweet, nectar-like beverage on a warm spring day after a nice round of tennis. Green Plant Beverage? Please. You can keep your algae-juice or whatever it is. The 13-year-old trapped inside this 31-year-old's body wants a sugar-shockin' rush of yummy red liquid confection. 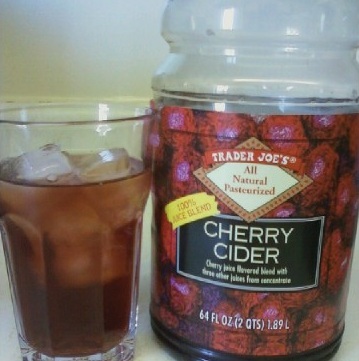 And that's exactly what this is, unfortunately for those of you who thought this was actually cherry cider. As we discussed in an earlier post about a different cider, this kind of drink should be "tangy and brown." Now, I'm not sure how the color is on your computer monitor, nor am I certain that my camera was properly color-balanced, but the liquid in the glass is definitely red. It's a deep red, approaching brown, but it is not brown. The packaging, too, hints that the drink within is bold red. And the beverage's subtle tartness is overshadowed by its Juicy Juice-like sweetness. I think the color red has come to be a symbol of classic sweet drinks. Coke cans are red. Everybody knows red Kool-Aid is the best Kool-Aid. When the makers of Mountain Dew decided their green beverage too greatly resembled a health drink, they introduced Code Red to make sure everybody knew they stood for rapid tooth decay and higher rates of diabetes death. This cherry-flavored beverage is, thankfully, very natural. They didn't dump cups of high-fructose corn syrup into it. It's actually just apple, cherry, plum, and pineapple juices from concentrate. Sonia shocked me almost as much as the candied-kick of the drink when she gave it a 4. I expected her to say it was too sweet. I give it a 4 as well, docking a point because it's not really what it says it is. But overall, it's a highly-chuggable, refreshing treat. If you like Juicy Juice, you'll want to check this stuff out. This is PERFECT to mix with plain carbonated water! I use my sodastream and fill a glass with 3/4 carbonated water and 1/4 Cherry Cider and it is the perfect cherry flavored soda that isn't too sweet at all. I love this stuff. I am a sucker for cherry but can't stand sickly sweet artificial drinks like Kool-Aid and Mountain Dew at this age. You're right that this drink is not cider, and that it is also very sweet. The above idea to dilute it with carbonated water (or other non-sweet beverages even, i'm thinking green tea would be fun) is good for those who don't like it too sweet, but I enjoy it how it is despite how sweet it is. I am a tea enthusiast and in my pursuit of unique teas and tisanes I stumbled across a Japanese drink called Sakurayu which is made from cherry blossoms pickled in plum vinegar (and can be sweetened with sugar if you like). They taste and smell so much more like cherries than you'd expect, and now whenever I taste cherries I associate it with the freshness and florality of the cherry blossoms. It's very refreshing and sort of mentally cancels out the syrupy sickly-sweet nature of most US cherry drinks. For now, I'm really loving this, though I think I'll need a break from it eventually just because of how sweet it is.